Confederate States of America. Assay Office. Dahlonega, Georgia Mint. Assay receipt no. 213 dated August 18, 1862. Signed Lewis W. Quillian, Assayer. Covering bar no. 213 weighing 81.73 ozs. of .900 fine silver and worth $98.89. Folds, minor holing, tape repairs on back, some foxing at top and tight bottom margin as seen on the other two known. Annotated on the back "Taken from a Silver Bar at the U.S. Treasury N.Y. on the 21st. December 1865-part of the Bullion captured in Georgia May 1865 with Jefferson Davis-also a 10¢ one Dime from the Specie". When the issue of the continued existence of the Dahlonega Mint was raised before CSA Secretary of the Treasury C.G. Memminger and the CSA congress in 1861, initial feelings were that the new Confederacy did not need a mint in Georgia (or at Charlotte, North Carolina, for that matter) and that Dahlonega should be closed. Opposition to this position was forcefully raised by Georgia gold mining interests and Memminger was persuaded that Dahlonega's continued existence was a matter of political expediency. But continuing the federal minting operation there was both impractical and unnecessary, so to compromise, Memminger suggested in the fall of 1861 that Dahlonega remain open as an assay office for the convenience of local interests and recommended Lewis W. Quillian, who had been on the old Dahlonega Mint's payroll the year before, as assayer. A G.T. Quillian was postmaster in Dahlonega and B. Quillian, a local miner active in 1862, made the third largest total number of bullion deposits to the CSA Dahlonega assay office. In January 1862, Quillian completed a formal inventory of the property he found on taking over the operations of the Dahlonega assay office and entered into his duties as Assayer. The following month, the CSA assay office at Dahlonega received its first gold bullion deposit. Between February and early July bullion assays were usually small in both size and number but in the latter month Quillian received nearly 1,000 ounces of gold and more than that amount of silver, representing more than 50% of all bullion assayed by the CSA at Dahlonega. This was bullion transferred to Dahlonega from the New Orleans Mint which had been taken over by federal forces in the spring and had been in transit since then. When it all was assayed, Quillian advised Memminger he had on hand 17 gold bars of .900 fine or better, 3 unparted gold and silver bars, and 196 silver bars of .900 fine. When Memminger told Quillian to ship the bullion to the CSA Treasury Depository in Atlanta Quillian replied he couldn't find anyone trustworthy enough to delegate the shipment to. In October 1862 Quillian advised Memminger he had shipped the bullion to Thomas Metcalf in Atlanta following directions from the military command in Atlanta. The shipment remained in Atlanta in 1862 and after that, became lost to history until captured with Jefferson Davis. The bars appear to have been shipped north to the assay office in New York City where they were melted for bullion. The cataloguer is unaware of any genuine silver or gold bars assayed and stamped for the Confederacy that survive, today. 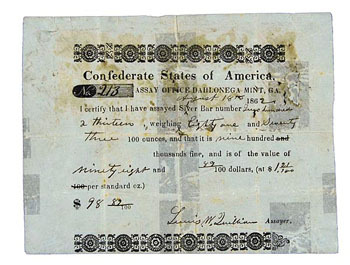 Dahlonega continued as the Confederacy's assay office in Georgia through the high war years of 1863 and 1864, but the number of assays run by Quillian was always low and more than two-thirds of them were for the Confederate treasury. By war's end the assay office must have been nearly idle, with most of its able-bodied men sent off to the army. Quillian stayed with the assay office and in fact lived in the building with his family. He ran occasional assays for local gold miners out of the building. In the summer of 1865 a troop of 40 federals was detailed to guard the building but was also ordered to stay out of it and leave the Quillian family alone. For the next few years federal authorities argued about what to do with the Dahlonega Mint and its assay office but in 1872 Director of the Mint James Pollock declared the southern branch mint and assay office "abandoned." What happened to Assayer Lewis Quillian and his family is uncertain; they seem to have been turned out of Dahlonega in the winter of '65. The cataloguer at Stacks was aware of only two other Confederate Dahlonega assay receipts: (1) No. 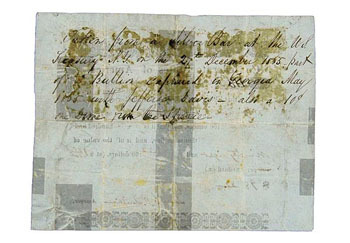 174 dated August 16, 1862 described as "VF, glue, stains at the top" that appeared as lot 887 in NASCA's September 25, 1987 sale provenanced as ex C.J. Affleck and (2) No. 167 dated August 15, 1862 that appeared as lot 1329 in R.M. Smythe's sale of December 13, 2005, ex Douglas Ball, C.J. Affleck. Although this specinum, Mr. Ford's, is not provenanced it is likely that all three of these extremely rare receipts originally came from Affleck's collection through Ball. Douglas sold the best of the three to Ford and kept the second best for himself. The three CSA Dahlonega assays represented by these receipts are quite similar. Bar 174 weighed 83.98 ozs., bar 167 weighed 81.67 ozs., and bar 213 weighed 81.73 ozs. Given assayer Quillian's lack of supplies and equipment in 1862 it is likely that the ingot molds he used to make bars for the CSA were the ones that had been used to make federal bars before Georgia's secession (these can be found described on Kellogg's 1861 inventory of the mint's assets). The 1987 Affleck receipt was the first one ever sold to a market that did not know such a delicacy existed yet it realized over $9,000. The 2005 Smythe sale specimen realized $11,500. The Ford specimum shown here brought $34,500 at the Stack's auction in October 2007. Click here to view the reverse.